He trains with the WSV Oberhof club, and is coached by Frank Ullrich and Fritz Fischer (national coaches) and Klaus Siebert (club coach). Sven Fischer is widely considered one of the best biathletes in the world. Fischer, who stands at 185 cm and weighs 85 kg, was born in Schmalkalden, Thuringia (former GDR)). His apparent talents for athletics was discovered early and already in 3rd grade he was training 3 times a week in the BSG Werkzeugkombinat sports club. In the 5th grade he became district champion of his age class. In September 1983 the boarding school Kinder–und Jugendsportschule (KJS) accepted him on a biathlon youth scholarship. After his exam in 1989 he joined the army studying to become a sports teacher. The German reunion and the fall of the Berlin wall and subsequent unification of the East and West German armies, forced him to leave the military in 1990. He instead started training for international sport events, but in 1989 when Fischer was 18 he had problems with both his kneecaps after a growth spurt as a youth. "I grew too fast and didn't stretch well." As a result he sat out the whole of the 1989 season and thought he might have to retire from the sport at the age of 18. However in the 1990 season when he came back he found that he had become more powerful than before his injury, and in December 1990 he celebrated his first European cup victory in sprint in Hochfilzen. One week later he participated in his first world cup relay. He was soon rewarded B–status and because of success in the German Championship in 1992 he qualified for the world cup in Pokljuka in December 1992. In 1993 he won a World Championship gold medal in the 10km Team in Borowetz, Bulgaria and a world cup race, in sprint, in Kontiolahti, Finland 99. In 1994 he won the Olympic bronze medal in the 20k individual. 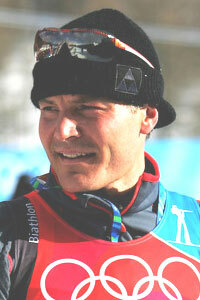 Since then Sven Fischer has been an integral part of the German biathlon team. As of 2006, Fischer has eight biathlon victories at the Holmenkollen ski festival, three in individual (1995, 1999, 2004), two in sprint (1995, 1999), two in pursuit (2002, 2004), and one in mass start (2001). * Fischer never wears gloves or a hat, owing it to his childhood where he would cut trees down in the winters with no hat or gloves. This somewhat macho statement possibly cost him the overall World Cup title in the 2004/2005 season, where Fischer missed the last race through a cold and ended up losing the overall World Cup to Ole Einar Bjørndalen by 11 points. * Fischer and his wife Doreen have a daughter named Emilia Sophie (*2004) and a son named Johann Alfred (*2007). He also has a sister named Andrea, and his brother-in-law is the great ex-biathlete Frank Luck. * When not in competition or training he works for Fiege WDZ as a clerk. * He can speak German, Norwegian, English and some Russian. * In the summer of 2003 Fischer and the rest of the German team recorded a song for the World Championships called “We are on the top”.